The cycle of crisis in the north of Ireland lurched towards the farcical this week as the Democratic Unionist Party blustered and threatened but, in the end, fudged an ultimatum to pull down the political institutions over allegations that the Provisional IRA still exists. After threatening to collapse the Six County Executive earlier this week, the DUP have now confirmed they will maintain a ‘zombie’ power-sharing administration by taking up and immediately resigning their Ministerial seats every seven days until the outcome of the current talks process becomes clear. Mr Robinson himself announced he had ‘stepped aside’ and four other DUP ministers had resigned from their positions in a melodramatic press conference on Thursday evening. 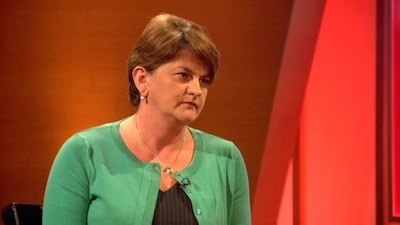 He also announced that party colleague Arlene Foster (pictured) would serve as acting First Minister and remain as a ‘gatekeeper’ Finance Minister, in order to prevent Catholic politicians from gaining access to Stormont’s finances. Talks between the five main parties are due to start on Monda. Sinn Fein, the SDLP and the Alliance have confirmed they will attend, but serious doubts remain about the sincerity of the two unionist parties, who have cited a number of preconditions. The talks, which are expected to last three to five weeks, are expected to include the unimplemented aspects of previous agreements, particularly the Stormont House Agreement and the long-standing deadlock over welfare cut. The 26 County Foreign Minister Charlie Flanagan is to co-chair the talks alongside British Direct Ruler Theresa Villiers. He warned there could be “be no room for brinkmanship” in the talks, saying they would need to focus on finding permanent and workable solutions. Sinn Fein’s Gerry Adams said the crisis had been “contrived” and driven by the desire of unionists to hold on to power at all costs. In an interview last night, Mr Adams said the Democratic Unionist Party and the Ulster Unionist Party are only willing to share power on their own terms. “It is all about power. They want to hold on to whatever power they have but it is power on their terms. It is not acceptable, those days are gone,” Mr Adams said. “All of these stops and starts have been about them trying to dilute and delay. There is also resistance within the Irish establishment because of the growth of Sinn Fein. Mr Adams said he did not know how the crisis had come to the point where an early election and collapse of the institutions was a possibility. “Peter Robinson during the plenary session of the talks last week, said - and he said this publicly, I think - that he did not for a moment think Martin McGuinness and Gerry Adams were in any way involved in the killing of Kevin McGuigan. The Louth TD also attacked Fianna Fail leader Micheal Martin for what he said was his “very stupid” and “irresponsible” call for the Assembly to be suspended by the British government. Sinn Fein also criticised Taoiseach’s Enda Kenny’s failed attempt to persuade the SDLP to support the DUP’s demand for a temporary adjournment at Stormont earlier in the week. The vote against the adjournment by the Assembly business committee provoked Robinson’s subsequent decision to withdraw his Ministers on Thursday. Mr Adams said his party is still seeking the full implementation of previous agreements. He accused other parties of “cynically” using “criminal killings” for electoral reasons. “They have sought to use these killings to exclude Sinn Fein, to renegotiate previous agreements and impose welfare and public services cuts on our people - this is wrong and unacceptable,” Mr Adams said. Commentators have suggested the DUP’s decision to stop short of collapsing the institutions can be explained by a reluctance to contest the Assembly election which would necessarily follow. The party was clearly surprised by the decision of their unionist rivals to walk out of the Executive last week, and have since struggled to reassert their hardline credentials. The DUP’s Arlene Foster certainly appealed to unionist hardliners (and infuriated nationalists) when she told a BBC interviewer on Thursday night that her only role in the Executive is to protect unionist interests from Catholic politicians, who she described as “rogues” and “renegades”. Mrs Foster, the DUP’s only remaining Stormont minister after her colleagues withdrew on Thursday, said her job would be to ensure nationalist Ministers “don’t take actions that will damage Northern Ireland and principally, let’s be honest, that damage the unionist community”. Sinn Fein’s Gerry Kelly described the remarks as a “throwback” and claimed Mrs Foster had displayed a “very bigoted view of what the institutions are about”. Former SDLP deputy leader Brid Rodgers said the comments were “extremely insulting” to the nationalist community. “I was completely aghast as I watched the interview and found it utterly disgraceful,” she said. Adding to the sense of chaos and dysfunction at Stormont are the unresolved allegations of major political corruption relating to a multi-billion-pound property deal organised through NAMA, the ‘bad bank’ of the 26 County state. While attending a cricket game in Yorkshire, British prime minister David Cameron said his presence isn’t yet necessary. “What’s going on in Northern Ireland is very worrying. It’s been great that we have had the Northern Ireland Assembly and the parties working together to govern that part of our United Kingdom and we don’t want that to come to an end,” he said.